The Siddhar (Tamil: Cittar from Tamil cittu meaning knowledge, singular Citta, Sanskrit siddha) are saints in India, mostly Shaiva, in Tamil Nadu, who professed and practised an unorthodox type of sādhanā (spiritual practices) to attain liberation. A siddha obtains yogic powers called siddhi by constant practice of certain yogic disciplines and tapasya. 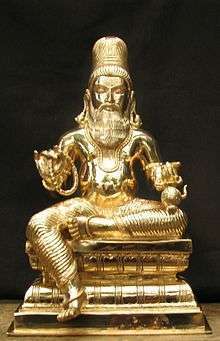 The siddhars can be compared to mystics in Western culture. Typically Siddhars were saints, doctors, alchemists and mystics all at once. They wrote their findings in the form of poems in the Tamil language, on palm leaves which are collected and stored in what are known as the "Palm leaf manuscripts". These are still owned by some families in Tamil Nadu and handed down through the generations, as well as being kept in public institutions such as universities in India, Germany, Great Britain and the United States. The Abithana Chintamani encyclopedia states that the Siddhars are either of the 9 or 18 persons listed below, but sage Agastyar states that there are many who precede and follow these. Many of the great Siddhars are regarded to have powers magical and spiritual. ↑ Meditation Revolution: A History and Theology of the Siddha Yoga Lineage. Motilal Banarsidass Publ. 2000. ISBN 9788120816480. ↑ S. Cunjithapatham, M. Arunachalam (1989). Musical tradition of Tamilnadu. International Society for the Investigation of Ancient Civilizations. p. 11. ↑ Journal of Indian history, Volume 38. Dept. of History, University of Kerala. 1960. ↑ Weiss, Richard (2009). Recipes for Immortality : Healing, Religion, and Community in South India: Healing, Religion, and Community in South India. Oxford University Press. p. 80. ISBN 9780199715008. ↑ V. Jayaram. "Study of siddhas". Hinduwebsite.com. Retrieved 2013-06-22. ↑ "18 siddhars". Palanitemples.com. Retrieved 2013-06-22. ↑ "Siddhars". Sathuragiri.org. Retrieved 2013-06-22. ↑ "Ashtama Siddhis". Siddhars.com. Retrieved 2013-06-22.